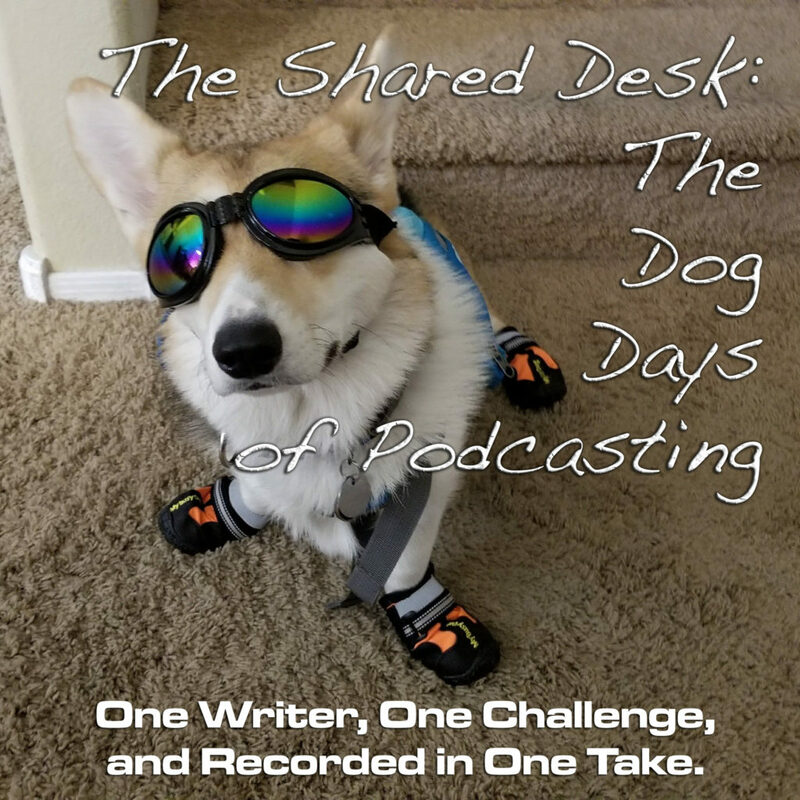 Leave it to the Dog Days of Podcasting to remind Tee that TODAY he and Pip were supposed to put out a new episode of The Shared Desk. Staying organized is hard, but Tee’s got a few tricks that help him out with projects, timelines, and appointments. What are you favorite organization methods? Share them with us here! So following the hangover that is a Kickstarter and edits for Ace Books, Pip and Tee wanted to take a break…but after a fun week with houseguest and ForeWord-nominated author, Katie Bryski, the microphones were dusted off, Soundtrack Pro was fired up, and Tee, Pip, and Katie put together a truly international experience with this edition of The Shared Desk. G’day, eh? We have a guest in the studio! Throw on the back bacon — it’s Katie Bryski! What the heck have we been up to? Katie’s even been up to a lot of stuff! Tee & Pip have been working the book events. Giving a shout-out to Trinity Manassas. Episcopalians RE-RAH-SENT! Tee and Katie share an EPIC COFFEE EXPERIENCE. If you were afraid, did you brave it out? No seriously, this was REALLY GOOD COFFEE! Katie Bryski talks about her own big steps out of a comfort zone. 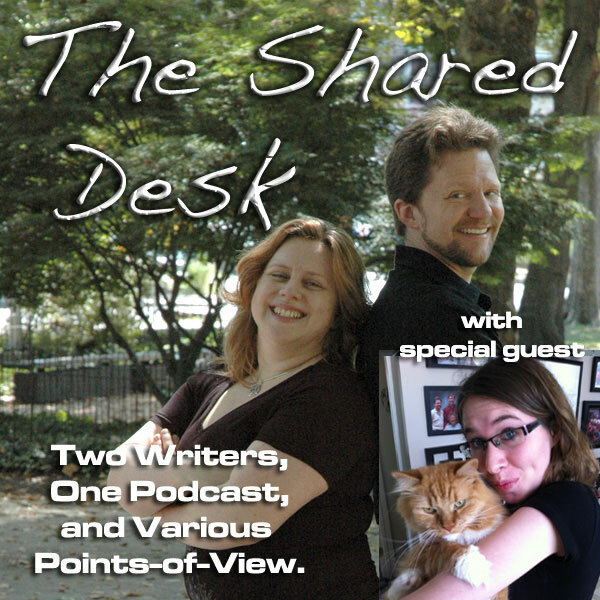 Podcasting a novel. Seemed like a good plan. Who knew our resident Canadian had a nemesis?! This new project Tee has nicknamed TeeMoNaNoWriMo. 50,000 words between now and July 31st. Who is the first person you call to get guidance with comic books: Jared F-ing Axelrod!!! My collection against the ManCave of Jared Axelrod! Prequels — what’s the point? How you grow from stepping free of a comfort zone? Pip and Katie put Tee to task on why marshmellows are an acceptable addition to sweet potatoes. Why does everything have to be so sweet in the South? And all roads lead back again to Vino 124 and THAT INCREDIBLE COFFEE! From wild beaver attacks to another Paula Dean rant! Where is Katie headed after this wild ride? Wow, everybody, we just did a show!